If you folks haven't seen the movie Thank You for Smoking, you should run right out and rent it, or at the very least, put it near the top of your NetFlix que. In it, the film's hero, a tabacco lobbyist, is trying to teach his son how to argue effectively. The two begin debating which is better, chocolate or vanilla ice cream. The son tries to argue that chocolate is the best, but his father says that he believes that people should have the freedom to look at both flavors, and even all the other flavors, and decide which one is best for themselves. That's a great argument for the tobacco companies, because it puts the death and illness caused by tabacco on the people who decide to smoke. This is an argument that I endorse, actually. I think cigarettes should be a controlled substance and that there is absolutely no benefit to smoking (or chewing), but I don't really blame the tabacco companies. The world would certainly be a better place if they weren't here, but the truth of the matter is that people keep Big Tabacco afloat. If we all stopped smoking tomorrow, they'd be up the creek without a paddle. But that's not my point. I bring up that argument because it's exactly the same argument that ID'ists are backing, but to a more limited degree. Evolution might be right, and it might be wrong, but people should have the freedom to look at the evidence themselves and embrace one or the other. That's the ideal argument, right? But it's not what the ID'ists are saying. Evolution might be right, but we think it's wrong, and life might have been created by some vague "Creator," but at any rate intelligently designed, because if you find a fork in the road somewhere you assume it was created, and in order to push our point across, we think that children should be taught both science AND psuedo-religion in classrooms across America, with equal time no less, and the children can have the freedom to decide which one they like best. But the teaching of Intelligent Design itself comes with some flaws. For one, the entire basis of the "theory" seems to compose of poking holes, many of which are outdated and moot, in Darwin's original theory of natural selection. Second, the next tier of ID seems to conclude that if it's complex, it must have been designed. There is no other alternative. So it's not a matter of vanilla, strawberry, rocky road, chocolate, butterscotch, peanut butter cup, or cookie dough. It's chocolate or vanilla, dammit, and you've gotta choose one or the other. And then you've got propoganda films like Expelled!, which misrepresent their interviewees, lie to their audience, and paint that tired line between Darwin and Nazis. In fact, in Hitler's case, the opposite may have been true, but you don't see scientists whipping together anti-religion films to make that fact painfully known. I don't think scientists are attacking the ID movement feverishly is because they don't see ID as a threat, and in terms of professional science, it's not, but in terms of public conscience, I believe it is. Why do I say this? 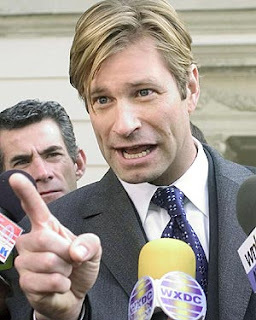 Because Aaron Eckhart makes another very important point to his son in Thank You For Smoking. "I'm not trying to convince you," he tells his son, "I'm trying to convince them." He gestures to the large crowd around them. The ID movement is not trying to corrupt the scientific community, but the public at large. That is the real threat, and that is the audience which science needs to actively pursue. I went to church and was happily corrupted in the goodness of the Lord! HA! Well, I've chosen. Comment my blog, damn you! Like Lantaro, mushroom aliens battling time ninjas, in my opinion. The tobacco choice argument would carry more weight if tobacco were not (1) addictive, and (2) promoted to minors. Thus, those "choosing" continue smoking were duped into addiction before they were (presumed) equipped to make a rational evaluation. Much the same with creationism/ID, actually. I just wrote a huge post... Then I realized what you are saying. You're saying intellegent design is wrong and evolution is right. You're NOT saying atheism is right and religion is wrong correct? Right. The ID movement is Creationism in a cheap tuxedo. Creationism is inherently tied to (Western) religion, so teaching religion in a public school would be advocating a state religion, which our Constitution prohibits (and rightly so). Physical evidence currently points to natural selection as the most reasonable explaination for how life changes (note: does not explain how life originated), and it's free of religious bias, so it IS taught in schools. Atheism may very well be WRONG--there may be a ruling power in the universe--but that has nothing to do with the validity of evolutionary theory. Ok that at least keeps religion out of it. And that's good! I personally see nothing wrong with the theory of natural selection, it only makes sense. To survive animals must adapt. However, adaptation in that sense does not make fish walk on land. That's my only issue. busafan: "However, adaptation in that sense does not make fish walk on land. That's my only issue." Issue resolved: the modern synthesis incorporates mutation (beneficial and neutral) into evolutionary theory. Fish that walk on land (I assume you mean tetrapods) do so because they were once part of a population of fish that had a mutation that proved beneficial.